Thimphu being the capital of Bhutan is home to some of its most important official buildings and institutes; all of which convey a lot about the history, culture and political and social context of this country. There is a lot that you can see around in the city and its outskirts if you are genuinely interested in understanding the essence of Bhutan’s rich heritage. From the Southern Border town Gelephu to Bhutan’s capital Thimphu, the distance is 242 km and the full cab fare is 4386 NU. If you have landed at Paro and wish to travel to Thimphu then you have to drive about 51 km and the cab will charge about 600 NU for the journey. From Sarpang in South Bhutan, the distance to Thimphu is 250 km and the full cab fare is 3825 NU. From Mongar to Thimphu the distance is 414 km and the full fare is 7820 NU while from Bumthang to Thimphu the distance is 271 km and the cab fare is 4539 NU. From Trongsa to Thimphu the distance is 192 km and the cab fare is 1190 NU. From Samdrup to Thimphu the distance is 503 km while the cab fare 8200 NU. Bhutan’s cab service (specially in the capital city) is government regulated (rates are still high) and so you will not find cab drivers charging wildly fluctuating rates at the mere sight of a foreigner. The main taxi stand is in Chang Lam and you can find a full or a shared cab from there. A ride around town will cost you approximately 70 NU and hiring a cab for a day’s sightseeing will cost you between 1200 NU to 1600 NU. In a day’s sightseeing, you can cover almost all the places listed below. 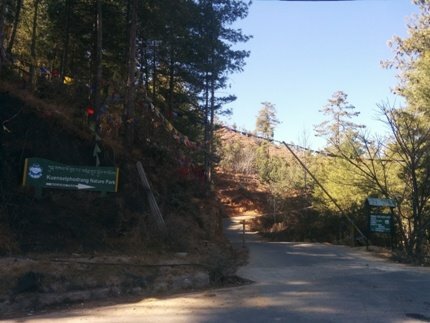 Unlike Paro, there are no fixed five points to which every tourist pays a visit though the Takin Preserve, Buddha Point, Trashi Chho Dzong and National Library are widely visited. The other museums and knowledge centers are very interesting if you have a specific interest in history and crafts of Bhutan. I covered the Dzong, Takin Preserve and Buddha Point in 600 NU by an ingenious idea suggested by a local shopkeeper. Here’s how you can follow my plan. Take a taxi to the Trashi Dzong from the local stand… it will only charge you 40 NU per head. The Dzong is in the main town and you can easily get a cab from there so leave the cab you just took. See the Dzong properly, it will take you a good 40 minutes and then take a cab from outside and ask it to take you to the Takin preserve. Ask the cab to wait while as you stroll around the preserve (the preserve is out of the town and its difficult finding a cab back). See the preserve (won’t take you more than 15 minutes) and then you can ask the same cab to take you to Buddha Point. The Cab driver charged me 400 NU for the whole journey from Dzong to Takin preserve to Buddha Point and back to town (post bargaining and off season rates). You will need at least 40 minutes if you want to soak in the beauty of Buddha Point properly. I paid my Taxi driver a little extra as I stopped at a lot of places for photographs and he waited for a long time. One valuable tip is to not mention that you are looking for a day’s sightseeing program when you are talking to the taxi driver…otherwise you get that 1200 NU rate!!! It’s a good idea to combine the visit to the Takin Preserve, Buddha Point and the Trashi Dzong in one day as these are on the same route. However as I mentioned earlier, make sure that you take local cabs from the local cab stand in the main market as a tourist taxi will charge you more. Open Hours: 9am to 5pm; Entry fee: 20 NU per person. 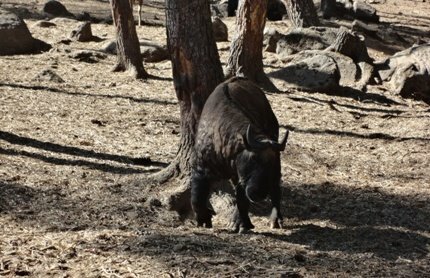 I had been wondering about the Takin since my first sip of the Takin red wine (very good quality Bhutanese wine) and I was rather intrigued about Bhutan’s national animal which looked like a cross between a deer and a antelope. As our helpful Taxi driver informed me, Drukpa Kunley (Bhutan’s most colorful sage) had conjured up the Takin after he was fed a whole cow and a whole goat for lunch. The Takin Preserve in the outskirts of Thimphun is built exclusively for the maintenance, breeding and upkeep of Takin. The Takins are said to be so gentle and docile that they are unable to defend themselves in the wild leading to near extinction and therefore government intervention to protect them. Takin is the national animal of Bhutan. Other than in Bhutan, this species of Takins can be found in Myanmar and China. They are actually a larger antelope of the goat antelope covered with hair. I somehow had this concept in my mind that the Takin preserve is a zoo and was quite disappointed at not seeing any other animals (apart from barking deer and Sambar) inside after my initial curiosity about the Takin had been quenched. There is a cute little café in the preserve where you can sip on tea/ coffee or have snacks. The seating area is quite pleasant. A perfect place to sip on a hot cup of tea. Like almost all places in Bhutan, the drive back from the Takin preserve offers great views. It will take you 20 minutes to reach Thimphu town and you will see great snapshots of the town. 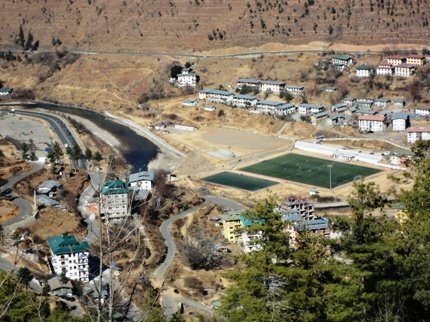 The Thimphu town…the football ground is seen prominently. 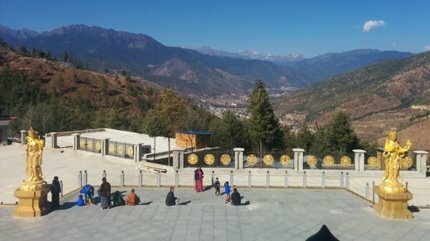 An unmissable place to go while you are in Thimphu is the Buddha point. For reaching the Buddhe point, you need to take a cab to Kuenselphodrang (roughly 25 minutes away from town). Make sure that you retain your cab driver as it will be difficult hitching a ride back home otherwise. 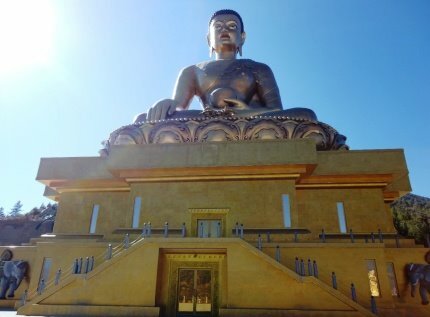 The Great Buddha Dordenma is 169 feet high and is made of pure bronze with gold gilding. The Great Buddha is seated amongst the remnants of kuensel phodrang and the ravaged sherab palace. The construction of this project was undertaken by Aerosung Corp of China who spent 100 million USD and ten years to complete the whole project. The project celebrates 100 years of Bhutanese monarchy and is built in accordance to the prophecy of Yogi sonam who wanted this statue to bring prosperity and peace to Bhutan. Interestingly, the Skyamuni Buddha statue (largest sitting Buddha in the world) houses 100,000 8-inch-tall and 25,000, 12-inch-tall Buddha’s. The TrashiCho Dzong always had a lot of political significance for Bhutan and its reverently referred to as “Fortress of Auspicious Doctrine”. Interestingly, the original version of the Dzong was built in the 12th century but it saw many dynasties of power struggles and rebuilding attempts before being destroyed completely by an earthquake in 1897. It was in 1902 that King Jigme Wangchuk renovated and enlarged it establishing it as the official Dzong of Thimphu. As of now the Trashi Chho Dzong has the house offices of the ministers, secretariats ad the king. The structure of the Dzong is beautiful wit triple layered golden roofs and the large glorious central tower…called Utse. The Trashi Dzong is also the seat of Bhutan’s leading spiritual icon Je-Khenpo. The colourful Thimphu festival, that is one of the primary attractions of Bhutan is held here. The Trashi Dzong is made of fitted and polished granite unlike the other Dzongs which are made of stone. There are two primary entrances; one to administrative section in south and another to monastic quarter in North. Do not miss the Cantilever bridge below the dzong and the tower near the western side. This tower contains a statue of Sakyamuni surrounded by Goddesses and deities. The Entrance fees for visiting Trashi Chho Dzong is 300 NU and the ticket has to be purchased from the counter near Agriculture Department Office. The counter opens from 2 pm to 6 p.m. on weekdays and from 9 a.m on weekends. Entry Free: 50 NU for Indians, 200 NU for other foreigners. This is a Folk heritage museum whose purpose is to develop understanding and appreciation about Bhutanese rural communities. The museum also conducts educational programs and documents rural lives. The biggest exhibit inside the museum is a reconstructed 3 storied traditional hut made of mud and timber that’s as old as 19th century. You can see it to get an idea about the average house in the Wang Area. An array of goods and equipment which could be used by a typical Bhutanese family are kept on display. There is also a small horticultural area where native flora is demonstrated. The museum is structured into different areas like courtyard, ground floor, middle floor, top floor, backyard etc. There is a Live event demonstrating Himalayan Music and Art on 19th February which you shouldn’t miss if you are around. Bhutanese textiles are beautiful…a glimpse of the traditional garments local men and women wear while walking down the street told me that. However as underexposed as most things in Bhutan are, the textile facet got proper recognition only after Her Majesty Queen Ashi Sangay Choden ordered the creation of the Textile Museum. The museum focuses on becoming a prominent centre of textile studies and conduct intensive research on Bhutanese textiles. Of special interest is the Ground floor where the wedding garments of the fourth king and his four wives are put on display. If you cross the courtyard you would be led to the Royal Textile Academy Conservation Center where weavers work on their looms. At the beginning, you would be shown a short film depicting the evolution of different Bhutanese textiles and variants of Gho and Kira (traditional garments). After you are taken through all the sections…the journey ends at the gift shop. However, the stuff inside is overpriced…there are better places to shop in Thimphu. All Bibliophiles must visit the National Library…it’s a virtual treasure house of manuscripts, rare books and archaic hard bound copies of royal scripts. This library was built in 1967 for protecting Tibetan and Dzongkha texts and you will be able to appreciate the fine architectural style of the building….it is in the form of a traditional Bhutanese temple (Lhakhang). You can ask question to the staff inside…usually they are quite friendly and helpful. Ground Floor: Choekhey, Dzongkha and Sanskrit texts along with 3 different editions of Buddhist Canon. A showcase in the reading room contains “Bhutan: A visual Odyssey” (largest published book on Bhutan). The book weighs over 60 kilos and is 5x7 feet in dimensions. The ground floor has 8 chortens signifying major events in Buddha’s life along with beautiful murals made by Kagyu alters. Pay attention to the crossbeams they have mantras written on them. The 1967 National Library of Thimphu. First floor: works on Gelung and Sakya traditions of Tibet and work by famous authors on arts, medicine, poetry and grammar are displayed. Pay attention a series of books bound in blue, these are extremely rare books called Southern Treasures that were discovered in a cave near Paro. 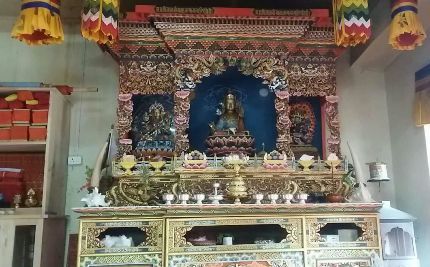 The alter on the wall has huge paintings of Zhabdung Ngawang, Padmasamambhava and Pema Ligpa (3 of Buddhist icons). Murals of Buddhas and Taras are also displayed. Second Floor: Buddhism has an intimate tantric connect and the second floor contains ample evidence of that. There are books about 100,000 tantras of ancient traditions and a collection of oral instructions by important tantric gurus. The altar on this floor has images of three Boddhisattvas and the murals are of Jampelyang, avalokiteshvara and Vajrapani. Top Floor: If you are not a book lover, you will still be fascinated by the letter displayed on the top floor…the letter is sent from Druk Desi to British army person Samuel Turner, back in 1783. Text excerpts from ancient printing presses in Nathang and Derge are also displayed. Along with intricately carved wooden blocks used for carving the books. Interestingly, the Tibetan style books are made from handmade paper that is stacked high between wood pieces and the cover is made of pure silk cloth. The altar on the back has Shakyamuni Buddha with 48 smaller Buddhas around it. Timing: 9 a.m. to 5 p.m.
A good place to go to if you are genuinely interested in the art of painting. This is the best painting institute in Bhutan and provides instructions in 13 kinds of traditional art (these are an integral part of Bhutanese culture). You can find demonstrations of all kinds of painting here starting from furniture to thangkas to religious murals to canvas paintings to woodcarvings like statues and bowls) and clay sculpture. If you love photography, then you wouldn’t be able to put your camera away as the students create wonders with their hands. 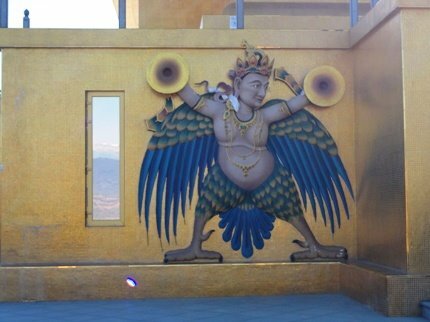 If you see the temples and Dzongs in Bhutan, each of them is filled with beautiful murals and paintings and this is precisely what students of this institute are trained to do in future. There is no guide so you can wander around and explore for yourself. However not all students are interested in discussions (quite understandably, tourists are a distraction for them). There is a shop where you can buy work made by the students at reasonable prices. 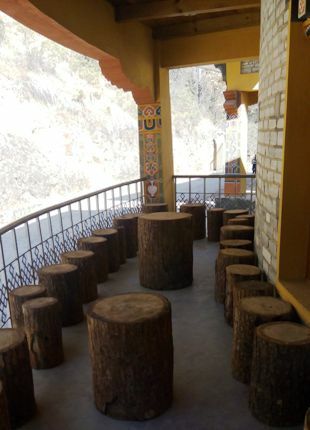 If you like craft, then you would like a visit to the Junghi Paper Factory Thimphu Unit even if you do not make it to the other unit in Jiminia (this one is 22 km away and produces recycled paper). The paper produced here is manufactured from natural plants (primarily Daphne that is insect resistant and chilli and hemp plants) and the paper goes on to be used in hand carry bags, envelopes, calendars, lampshades etc. Such is the loveliness of paper that every scribbled note becomes a pretty memento. Incidentally this is a relatively new establishment as it was founded in 1990 by Ministry of Trade and Industry. The name Jungshi means natural. The paper products are exported to Japan, Nepal, India, USA and Europe. There is a shop inside from where you can buy paper products, lampshades, notebooks etc.